Well I must say, I think it's been forever since my last post. It's not as if I have no projects to tell you about. But actually completing a project around here lately has been, let's say, challenging. So instead of showing you a finished project today, I've decided to settle for progress. Progress on my Laundry/Craft room that is. While this isn't what I'd call pretty, it is what I'd call functional. And when you're knee deep in projects and searching for that dang glue gun you just know you have but absolutely can't find and you're so sick and tired of never being able to find anything that you stop in the middle of your project, rip the books off the unsuspecting shelves in the basement, cart said shelves upstairs and embark on an organizing project that takes all weekend and has you carting boxes of "craft stuff" from 3 different rooms... well then functional is just pretty awesome! See, I found the glue guns. So now I can head into my Mini-Michael's (yes, that's what it feels like now :) and find paint, fabric, brushes, GLUE GUNS, etc. any time I want. The other thing I attempted to organize on that crazy weekend, was my laundry. If you're really brave, you can check out my post HERE where I had absolutely no shame, and showed you my horrifying mess of a laundry room. Laundry has been my downfall for, well, EVER. But I think I might have finally figured out a system that works. Ignore the unfinished cabinets... we're getting there. And it has been like this now for a few weeks! CLEAN, with all the laundry PUT AWAY!! No, we didn't stop wearing clothes. The 4th basket in the back is for the dirty clothes... if the washer's in use. Now I will first confess that we have 2 sets of washer and dryers. One by my room, and one in the basement. Yes, I'm even lazier than you thought. My girls are in the basement and they each do their own laundry. So that mess you saw, that was just from 3 of us. But somehow, those 3 laundry baskets (one for each of us) have been my savior. All our laundry is coming off our bodies and going straight into the washer. When it comes out of the dryer, each persons clothes goes into their respective basket, and we are then responsible for folding and putting away our own clothes (my son is 10, so this works). I'm doing 1 load every other day and it's going perfectly! I don't know why this is working when nothing else did. Maybe spending a weekend cleaning and organizing made me unwilling to go back to the way it was. Maybe I just hate folding so much that only having to do my own makes me a tad giddy. Hmm, that might be it. Oh, there's one more thing that's helping. I bought 3 of these. Lingerie bags. They were .99 cents a piece at WalMart, and each one of us has them hanging on our closet door. All our socks and underwear go in the bags and get thrown in the wash.
No stray socks getting lost in that washer black hole!! And, I only have to take care of MINE! I have no idea if this system would work for anyone but my family, but I thought I'd share anyway. 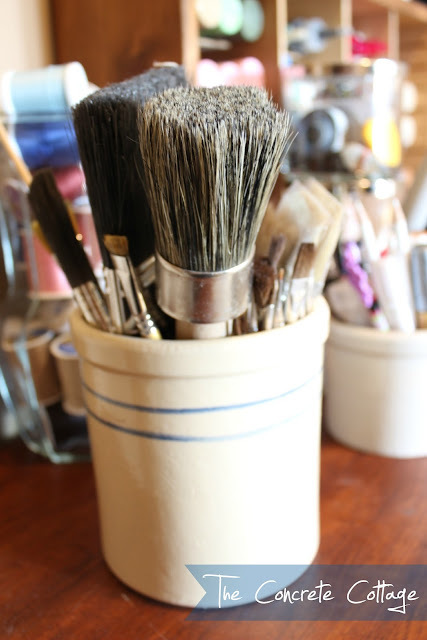 And if you have any additional tips or tricks you use to stay organized in the laundry room, I'd love to hear 'em!